Redondo y Garcia has its origins in 1941, when two entrepreneurs, Adolfo Redondo and Valentin García, decided to join their and their families professional destinies, setting up a small hardware supply company. The first years, in postwar Madrid, were very hard but soon they gained the trust of customers and in a few years positioned the company as a leader in industrial supply. Currently in Redondo y García we have established ourselves as a leading company in the industrial supply arena in Spain, in exports of machinery and equipment, and as a organization that develops and implements turnkey projects in the Health, Education and Civil Works sectors. Family business, managed by the 3rd generation, with 100% Spanish capital. Over 10,000 m2 storage warehouse, with a permanent stock of 20,000 references. Product catalog with 35,000 references from 1,000 national and international suppliers. Distribution of material in stock within 24 / 48h to mainland Spain. Headcount of over 65 professionals. 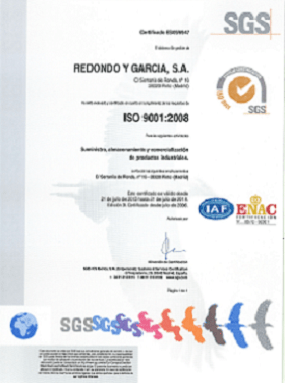 Awarded ISO 9001 and ISO 14001 certificates Quality and Environmental Policies. Software stack integrated with suppliers and customers procedures. Use of major Spanish purchasing portals: Obralia, ADQUIRA, PROTRANS, Quadrem. B2B sales portal available to all our customers in order to simplify and integrate the sales process. 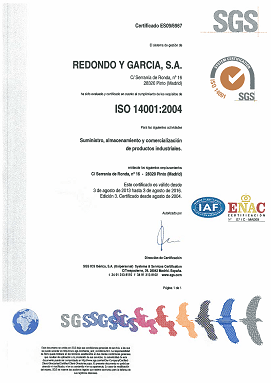 Redondo y Garcia Group, based on its ongoing commitment to product quality and responsibility and respect for the environment, manages its production processes to ensure the highest quality standards according to the following regulatory certifications implemented in our company. 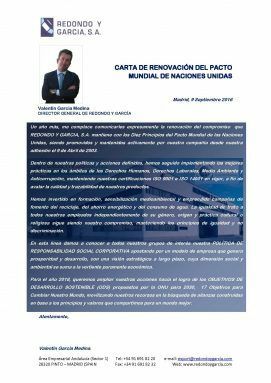 Since 2003 we are members of the United Nations Global Pact committing ourselves to its principles in the Human Rights, Labor Standards, Environment and Anti-Corruption áreas.